Below are some of our FAQ's about recipes, cookbooks, cookbook publishing, and cookbooks in general. Aren’t there too many personalized cookbooks being published? Shouldn’t we give our cookbook order to a local printer? Can small groups have a successful cookbook fundraising drive? Can individuals and businesses publish a cookbook for profit? How does a 10% overrun/underrun affect our cookbook order? Can we change the title on Fundcraft cover designs? Can we print recipes from newspapers and other cookbooks? Can we use art and drawings from other sources for our cookbook? Do we have to use Fundcraft’s recipe collection letters? Do recipes have to be typed? Do you count icings for cakes as a separate recipe? Do some civic organizations require royalty payments for the use of their logo? Can we change the recipe section titles on Fundcraft divider sets? What is the average number of recipes in a cookbook? Can we order fewer than 100 cookbooks? No. Because your cookbook is completely unique with local recipes from your community and your organization’s members. There is no other cookbook just like yours. Local printers do a fine job; however, many of them refer orders to Fundcraft. Due to our volume, it is not likely that a local printer could come close to our prices. Can small groups have a successful cookbook fundraising drive? Yes. Most of our success stories are from small organizations. A minimum of 10 members can complete the program successfully. Yes. The program is the same as with fundraising groups except for the payment terms, requiring 1/2 payment when the order is submitted and the balance when the books are printed and ready to ship. Your cookbook travels through many stages in our printing process. During production, some books may be damaged. We add 10% more than what is ordered to cover books damaged through production. Out of the 10%, we ship 3% in Free Freight Books. If books are damaged, we may ship less than a full order. You are only billed for those books you receive. Many of our cover designs can have the title changed. Under each design is an explanation of what can be changed. Yes. You can use recipes from various sources. There are a few recipes that have the title trademarked or copyrighted and cannot be used, such as Kentucky Silk Pie, Derby Pie, and Runza, to name a few. You can not use complete works from any book due to copyright laws. The personalized cookbook publishing program is designed for group members to submit their favorite recipes and in many cases, those recipes have been changed for their personal tastes. Artwork from books and greeting cards is usually copyrighted. It is better to use Fundcraft art or have a local high school art instructor or other local artists design a custom front cover. No. We supply the recipe collection letters free if you request them; however, you can collect the recipes on plain paper the size of the recipe collection letters or larger. We do ask that they be submitted in the same format as our collection letters and only one recipe per page, and on uniform size pieces of paper. No. Clear handprinted recipes are acceptable. No. If the icing goes with the cake, it is counted as only one recipe. Yes. In some cases civic organizations charge a royalty for local chapters to use their logo. If this is the case, you, as the cookbook sponsoring group, are responsible for any royalty payment or release form from the group headquarters. No, the section titles on Fundcraft full-color divider sets are preprinted and cannot be changed. Titles can be changed on Fundcraft black and white divider sets. And of course, you are free to select your own titles on custom dividers. 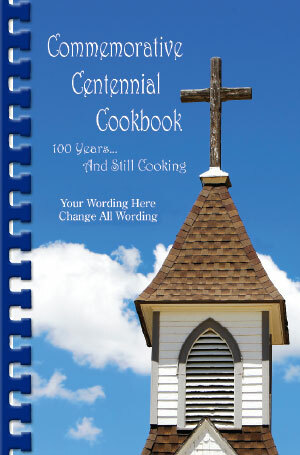 Our cookbooks average 200 to 300 recipes. While we have no minimum number of recipes, we recommend at least 150 in order to make your book thick enough to encourage sales. No, the minimum order for the Original Program is 100 books; however, if you are interested in placing a smaller order, our InstantPublisher program has a minimum order of 25 copies.